Over the course of my 'human machine' series of posts I've tried to convey the intricacy and beauty of our biological engineering, and demonstrate that we are incredibly well-engineered machines whose complexity and originality go all the way down to the atomic level. In this week's post, I will be exemplifying this with one of the best cases that I can think of; how we transport oxygen around our bodies. I feel that this is a great story to tell because it is one that most people might think that they know well, but that actually is far more complex and subtle than it may appear, and that demonstrates how our lives are highly dependent on perfectly evolved processes working on the subatomic scale. "It will have blood, they say." I'm sure that anyone reading this blog is fully aware that we need oxygen to survive (although if you want a more detail explanation of exactly why then I direct your attention to a previous post of mine available here), and anyone remembering their primary school biology will know that oxygen is transported around the body by the circulatory system, i.e. the blood. Most of the cells within your blood are the famous red blood cells (to distinguish them from the immune cells - the white blood cells), which are, unsurprisingly, responsible for blood's distinctive colour - earning them the respect of horror movie aficionados everywhere. 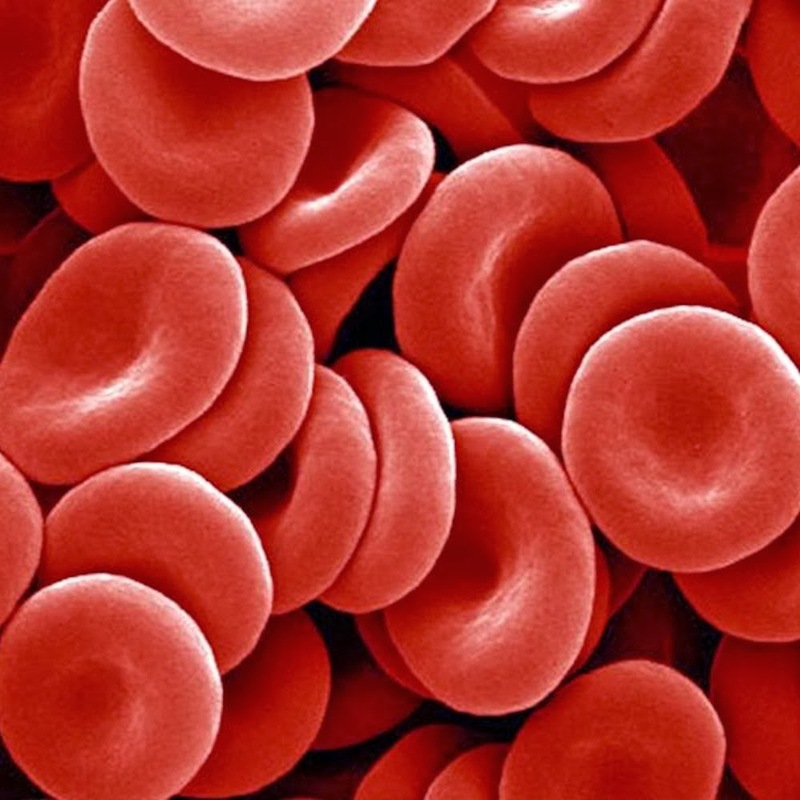 You have roughly 20-30 trillion red blood cells in you as you read this, each of which is about 7 microns (i.e. 7 millionths of a metre) in diameter. They shoot around your body, taking roughly 20 seconds to make one circulation, and have just one job; take oxygen from the lungs (where there's lots of it) to the tissues (where there's not). So specific are they to this job that they don't even bother having a nucleus, thereby removing all possibility of them doing anything else. Human red blood cells - you make 2 million every second! What allows red blood cells to do their job so wonderfully is the same thing that gives them their bright red colour: haemoglobin. Haemoglobin is one of the most abundant proteins in the human body - each red blood cell is packed with around 250 million copies of it - meaning you have about 7.5 billion trillion copies in your whole body! The role of haemoglobin is fairly simple, it increases the solubility of oxygen compared to just letting the oxygen dissolve in the water that makes up most of your blood. It does this using four distinct oxygen-binding centres within its structure - each called a haem (or 'heme' if you're from the colonies) group. Each haem centre contains a captured atom of iron, which is capable to forming interactions with molecular oxygen, thereby allowing four molecules of oxygen to be captured by one haemoglobin. So far, so good. There is, however, a fundamental problem with a haemoglobin molecule that simply binds oxygen with a single, unchanging strength. If haem binds oxygen really well then it will be great at capturing it in the lungs where there's plenty of it, but then will still hang onto it in the tissues where it needs to release it. Conversely, if its interaction with oxygen is weak enough to allow it to let go in the tissues then it won't be terribly efficient at picking it up in the lungs. Ideally, you need a haemoglobin that binds oxygen really strongly in the lungs, but then changes to be much weaker in the tissues so it can dump it out where it's needed. To a chemist this may sound a bit fanciful - the interaction strengths of one species with another are determined by the myriad factors that decide their charge, electron orbital structure, size, etc., and they can't just be changed to suit our needs. This is indeed true if you just take free haem without the rest of the haemoglobin protein and watch it bind to oxygen - the strength and affinity of the interaction is consistent no matter how much oxygen is around (under standard conditions, of course). In haemoglobin, however, an odd effect can be seen as the concentration of oxygen changes: the more oxygen that haemoglobin binds, the more the strength of this interaction increases. Similarly, as it starts to lose its oxygen at low oxygen concentrations, it does so faster and faster as oxygen levels drop. This process is vital for our functioning as large animals that consume a lot of oxygen, as without it we either wouldn't be able to get enough oxygen out of the air, or wouldn't be able to release it into our tissues. Either way, we'd be screwed. So, how does it work? Well it all comes down to the fact that each haemoglobin has four oxygen-binding haem groups rather than just the one. Each haem is attached to a single protein chain (either alpha or beta), which in turn come together to make two pairs containing one alpha and one beta, and then two pairs come together to make the whole haemoglobin. When oxygen binds to one haem group, it causes the affinities of all the other haems in the complex to slightly increase their affinity for oxygen. So, the more oxygen molecules that get bound, the greater the affinity of the remaining oxygen-free haems will be for interaction with oxygen. This is a process called positive cooperativity, and is a feature common to many multi-domain proteins within your body. What I like in particular about the cooperativity of haemoglobin is that it directly relies on the principle of quantum mechanics describing how electrons have wave-like behaviour rather than behaving purely as particles. Clearly, all biology is based on this since it's a fundamental property of the universe that governs all chemical reactions, bond stabilities etc., but this is a rare instance in which Newtonian physics could not reasonably approximate the outcome of a biochemical process. This is because the cooperativity of haemoglobin depends on the ability of the iron ions within the haem groups to change their shape upon binding oxygen. Specifically, they change the shape of their electron orbitals. If you're not familiar with the behaviour of electrons, they exist in discrete energy levels (known as orbitals) surrounding the nucleus of atoms, and their distribution within these orbitals depends on exactly how many there are present in the atom. Different orbitals have different shapes, and so the atom essentially can have different sizes dependent on how many electrons it has at any given time. In haemoglobin, the irons in haem are in what's called the 'high spin' state when they're not bound to oxygen. In this state, the electrons arrange themselves in such a way that the radius of the iron is 92 picometres (i.e. 92 trillionths of a metre), with the shape shown in the figure below. When an oxygen comes along and binds to it, however, iron's electrons reorganise into the 'low spin' state, which has a far more streamlined radius of just 75 picometres. The high (left) and low (right) spin states of iron in haemoglobin. The tiny change of 17 trillionths of a metre is responsible for your being able to breathe. The change in the shape of iron isn't on its own particularly significant, though it has profound implications for the rest of the haemoglobin molecule. This is because the iron within the haem group sits inside a system of flat rings that form four bonds with it to hold it in place. Iron is capable of forming six bonds at the same time, so it also forms one with a specific amino acid within haemoglobin (called the proximal histidine), and then the sixth is left free for oxygen. The problem is that in the high spin (i.e. without oxygen) state the iron is too wide to fit snugly into the centre of the ring, and instead has to sit 60 picometres outside of the ring. This is not favourable because it can't form the strongest possible bonds with the surrounding ring, and it also forces the proximal histidine to be pulled slightly out of its optimal position. It's a bit like there's a spring pulling on the iron, trying to force it into the centre of the ring, but it can't because the iron is too big. Iron (Fe) within the ring system of a haem group. Once the iron has bound to oxygen, however, it is small enough to enter the ring thanks to the quirks of quantum mechanics that cause its electron orbitals to rearrange. The movement of iron into the plane of the haem allows the proximal histidine to relax into its more optimal position, thereby releasing the strain on the 'spring' pulling on the iron. In effect, the whole haem has adopted a lower energy arrangement, and hence why this is known as the 'relaxed' state of haemoglobin. Movement of the haem iron from outside the ring (top) to inside it (bottom) on binding oxygen. "Give me somewhere to stand and I can move the Earth." So how does the 'relaxation' of one haem group allow for positive cooperativity. Well, any schoolboy who's studied his Archimedies can tell you that the way to amplify a force is by using a lever. This is basically what happens in haemoglobin: the movement of the proximal histidine causes one of the helices within that subunit of haemoglobin to pivot around a fixed point. This means that the ends of the helix move much further than the proximal histidine ever did, and so the effect is amplified. The movement of this this helix kicks off a whole chain of changes that cause the two alpha/beta pairs to rotate relative to each other, such that the conformation of the whole haemoglobin molecule is changed. This has the effect of pulling more strongly on the irons in the oxygen-free haems (i.e. putting more strain on their 'springs') so that if they do happen to bind more oxygen they will do so more strongly as giving up the oxygen would mean having to fight that much harder against the pull of the spring. Thus, for every oxygen bound, the next one will bind just that little bit tighter; and similarly as the haemoglobin loses its oxygen, each one will come off that bit more easily than the last. The two states of haemoglobin (courtesy of Wikipedia). The two alpha/beta subunits rotate relative to one another to alter the affinities of the coordinated haem groups. Haemoglobin is a great example of how even the most basic jobs in our bodies are engineered down to the finest details - changes of trillionths of a metre are harnessed and amplified to adapt the human machine beautifully to survive as best it can. It's also a nice reminder that we are very much children of quantum mechanics, even if we forget that a lot of the time.